7mm to 7.5mm round (spherical). 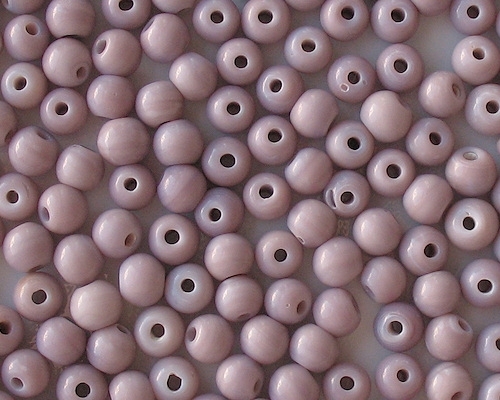 From hole to hole, the beads measure 6mm to 6.5mm because the hole on either end creates a flat spot. Opaque light grayish lavender. When viewed close up, a swirl pattern can be seen in the glass. 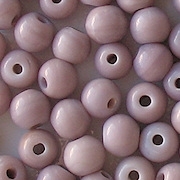 The finish on these beads isn't as glossy as I often see on other beads, but they aren't matte either. 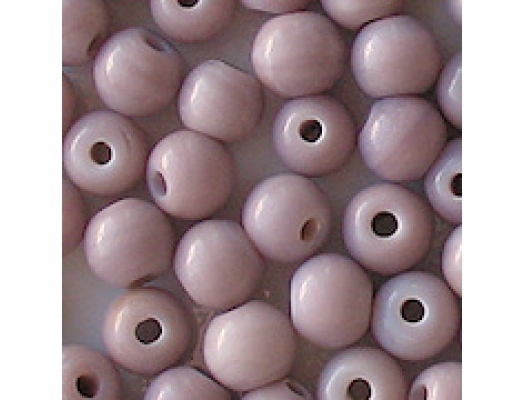 Defects: Indian beads are rarely perfectly formed and shaped, and these are no different. Some are a little smaller than 7mm and some are a little bigger, and a few are malformed. Also, some of them have flat spots around the holes, and a few have pits. When I notice defects, I remove the defective beads, but I don't always notice them (inspecting every bead isn't possible). Because of the defects, I set the price fairly low (see comments). Comments: Every once in a while I get Indian beads because they have a different quality from Czech beads. These beads are fairly plain, but I still like them. I purchased two lavender colors, and this one is the lighter (the other is G2018). 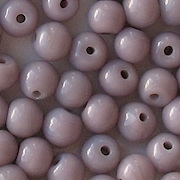 These beads are completely opaque, whereas the G2018 beads have a slightly milky quality (but are also opaque). Since I am comparing the G2018 beads with these beads, let me say a little more. These beads were more expensive than the G2018 beads, but they have more defects. I am selling them at the same price as the G2018 beads, but that represents a bigger discount (the bigger discount is necessary because of the greater number of defects). Oddly, the supplier calls the G2018 beads 6mm, but calls these beads 7mm, even though they are just about the same size.